Colorado Avalanche center Nathan MacKinnon (29) skates with the puck against Buffalo Sabres goaltender Carter Hutton (40) during the third period at KeyBank Center. (Photo: Kevin Hoffman-USA TODAY Sports). Nathan MacKinnon has scored in all four of Colorado's games this season, now has five total after netting two on Thursday night on the road. 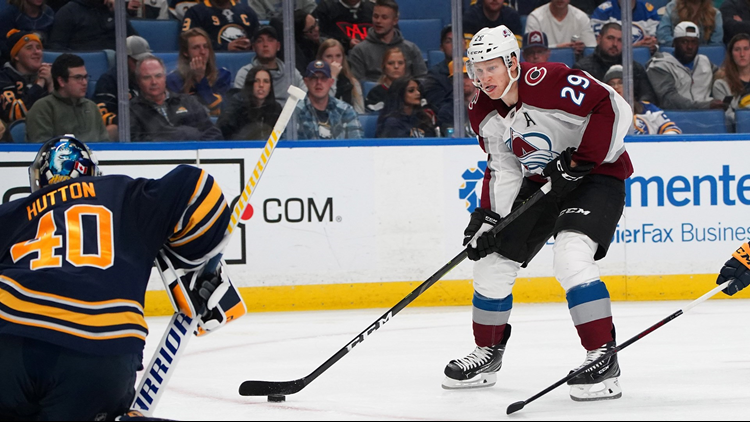 BUFFALO, N.Y. (AP) - Nathan MacKinnon scored twice to extend his season-opening goal streak to four games and the Colorado Avalanche beat the Buffalo Sabres 6-1 on Thursday night. Semyon Varlamov stopped 30 shots to improve to 3-0. He's allowed just four goals this season. Tyson Jost, Colin Wilson, Carl Soderberg and Alexander Kerfoot also scored, helping Colorado improve to 3-1 for the third straight year. Mikko Rantanen set up three goals and has six assists for the season. Mackinnon matched the Colorado franchise record for a goal streak to open a season, set by John Mitchell three years ago. Sabres defenseman Rasmus Dahlin , the first overall draft pick this summer, got his first career point with an assist on Nathan Beaulieu's goal that cut the Avalanche's lead to 3-1 with 2:27 left in the second period. Buffalo (2-2) squandered a chance to match last season's team-best three-game winning streak. Carter Hutton made 24 saves for the Sabres. The Avalanche fulfilled coach Jared Bednar's objective of getting off to a better start two nights after falling behind 2-0 midway through the first period of a 5-2 loss at Columbus. Against Buffalo, Colorado built a 2-0 lead 13:20 in on power-play goals from Jost and Wilson over a span of 2:25. Jost scored by tipping in Tyson Barrie's shot from the right point. Wilson scored when Samuel Girard's shot from the blue line was blocked by Buffalo's Conor Sheary. The puck dribbled to Wilson, who scored from the slot. Soderberg capped a three-goal first period by winning a faceoff to the right of the Sabres net and converting a centering pass from Gabriel Bourque, who was circling the net. The Sabres had a goal disallowed following a coaching challenge for goaltending interference with 22 seconds left in the first period. Officials determined Kyle Okposo interfered with Varlamov when he crashed into the crease to convert Jack Eichel's pass. After redirecting the pass, Okposo backed into the goalie, forcing Varlamov to lift his right pad and allowing the puck to sneak in beneath it. MacKinnon regained Colorado's three-goal edge by scoring 28 seconds after Beaulieu. It came on a broken play during which a pass along the left boards inside the Sabres zone got caught up in the skates of referee Francis Charron. Rantanen picked up the puck and set up MacKinnon for a one-timer at the left post. NOTES: Colorado converted 2 of 4 power-play opportunities, while Buffalo went zero for seven. ... Avalanche C Vladislav Kamenev made his season debut. Acquired from Nashville in a three-team trade in November, he missed 50 games after breaking his arm in his Avalanche debut. ... Sabres LW Johan Larsson made his season debut since sustaining a lower body injury during the preseason. D Zach Bogosian (lower body) was placed on injured reserve.